Designed by Michigan's Amy Sorensen of Lebe Loola, this unique pendant is from out of this world. 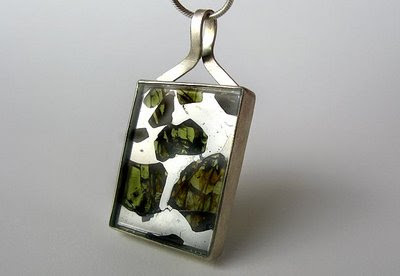 The pendant contains a thin slice of the highly sought after Esquel pallasite meteorite. 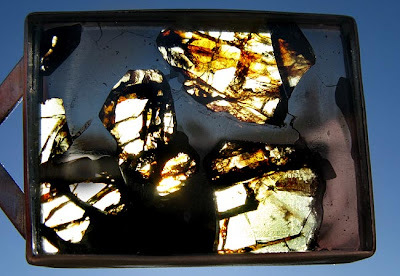 Pallasites are very rare and contain olivine crystals--actual gems from outer space. This pendant SOLD, however, if you would like something similar, please call me at 801.971.5240. Photos by Geoffrey Notkin of Aerolite Meteorites.